MARKHAM GLOBAL Australia are suppliers and application experts of AQURON 300 3n1 liquid additive for concrete. Proven in Australian conditions, AQURON 300 additive is being utilised for waterproofing and durability enhancement of concrete infrastructure, concrete basements, car park decks, swimming pools, water retaining structures, concrete in corrosive environments and all types of construction. AQURON 300 works on the SIMPLE LOGIC working in the MIX WATER the additive increases cement particle saturation and improves overall cement utilisation in any concrete mix, while forming a HYDROGEL in the porosities that TRANSFORMS MOISTURE. AQURON 300 liquid additive while improving hydration of concrete provides integral waterproofing impermeability and internal corrosion protection. The improvement hydration of concrete with AQURON 300 additive also makes concrete stronger, increases early and ultimate compressive, flexural and tensile strengths which results in less shrinkage and slab curl. Reducing drying shrinkage (and consequently slab curl etc.) is a key to eliminating cracking. AQURON 300 produces a very homogenous mix, making placing and finishing EASIER and FASTER. Benefits include ease of handling, improved workability and pumpability, with no other admixtures required. AQURON 300 liquid additive is simple to add to concrete and can be fully integrated into plant command control-systems, providing precise dosage and automated record for warranties. Compatible to be used with air-entrainment and ASR aggregates, while eliminating need for other admixture. The AQURON 300 LIQUID additive also reduces manual handling, provides improved batching and logistical efficiency, while eliminating human exposure to carcinogenic powders of traditional waterproofing additives - saving time & money. This non-hazardous, 100% VOC free additive is a safer choice. 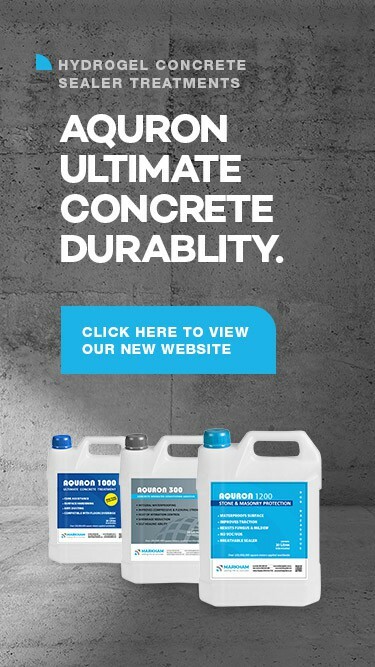 AQURON 300 results ULTIMATE concrete protection and concrete waterproofing from when the concrete is poured for any Australian Concrete structure.